It's tulip blooming time in British Columbia again. You know spring is finally here when you can see the amazing symphony of colour in every square inch of available space. There are whole festivals dedicated to honouring the tulip. Just driving along the 401 Highway from Vancouver to Hope, a nice hours drive through some pretty scenic vistas, can make you weep at the variety of colours. People are out in droves with cameras and tripods and whoopdedoo lenses to get some pretty phenominal shots of the fields. Personally, I like the individual tulips. The ones that can just "be" themselves in whole worlds of "see-me-first" colour. Not perfectly straight or perfectly formed. Just being what they are in the group of flashy others. The geeky flower. The one with personality. Gotta love how Mother Nature resembles us in life. got your comment on my blog.thanks for visiting.wow! the pics on this blog are awesome..
tulips always get me excited no matter in what form..Like this composition,too! love tulips, one of my favourite flowers!! and i hv to say u hv amazing photos here!! keep the good work!! if you're a fan of tulips then you should visit Kazakhstan, the wild tulip is my favorite among the many kinds, I heard it can be only found there. Anyway, nice photos! keep it up! It's blooming in Victoria too. Alas the Cherry blossoms are falling. I just listed your blog. Thanks. I didn't know there was a tulip festival in BC. I will have to plan a trip down one year to see it. I especially miss the spring flowers here although we do get them but much later than the lower mainland. Thanks for the message you left. 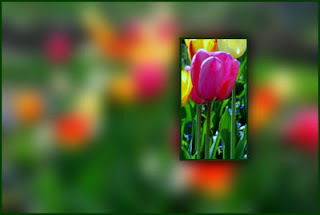 i just saw a tulip field picture in the global news, i forgot where it was taken, pretty big field with lots of tulips. i wonder anyone here know any tulip fields here in BC ? Hi anonymous -- Seabird Island (GPS 49 14'60.00 N 121 44.05.14 W) is one area that has been photographed in BC a lot -- tulip fields with mountains in the background.